Tell Mayor de Blasio to reverse the Department of Buildings ruling weakening protections against phony dorms, and not to issue permits for construction at the old P.S. 64/Charas. I strongly urge you to overturn the Department of Buildings ruling from May of 2016 which would allow the developer of the old P.S. 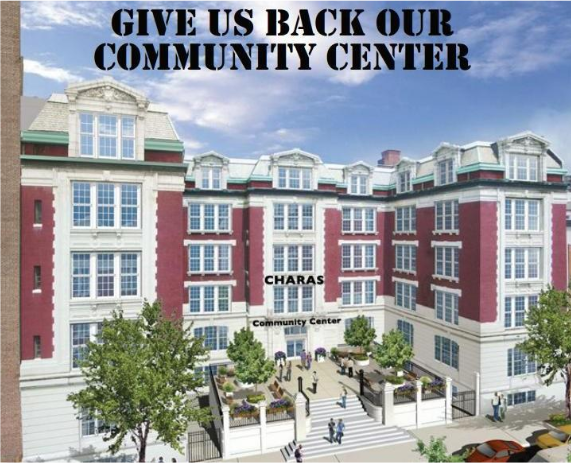 64/former Charas-el Bohio Cultural Center at 605 East 9th Street (Manhattan) to get around rules restricting dorm construction and receive permits to build an illegitimate 'dorm' at this site. The developer has been using the same lobbyist hired to undo the deed restriction nearby at Rivington House to try to get around critical protections and turn this former community center into a profit-making "dorm for hire." The Department of Buildings ruling is wrong and dangerous. It would allow developers to construct what they claim are dorms without having the appropriate documentation and commitments in place to prove these projects are what they are supposed to be. In the case of 605 East 9th Street, the developer does not have the required lease in place with an accredited institution committing them to use each bed in the entire proposed dorm. Instead, it is a "dorm for hire" scheme where beds could be rented out to others claiming to be students, in violation of the requirements for dorms. This violates rules which community groups fought hard for. This developer has never acted in good faith. The old P.S. 64/former Charas-El Bohio should be returned to a true community use. Do not allow lobbyists to give away another piece of the East Village/Lower East Side's precious community resources to developers.